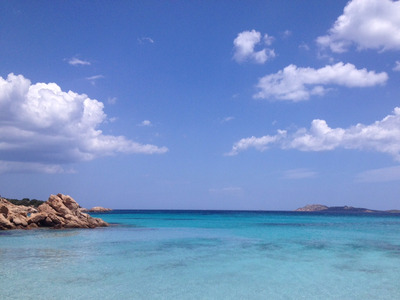 Libby Kane / Business InsiderSpiaggia di Capriccioli, along the Costa Smeralda in Sardinia. I’ve written before about how my favourite money-saving travel tip isn’t poring over flight websites or negotiating with hotels: It’s travelling in shoulder season. By choosing to travel six to eight weeks before or after high season (“shoulder season”), I save money on flights, accommodations, car rentals, and most everything else by making one decision and never thinking about it again. It seems obvious, but a lot of people don’t do it. There’s a good reason why: Travelling in shoulder season means things are more likely to be imperfect. The weather could be less reliable, the transport could be less consistent, and the scene could be less vibrant. If imperfection stresses you out unduly, this probably isn’t the strategy for you. It is the strategy for me. 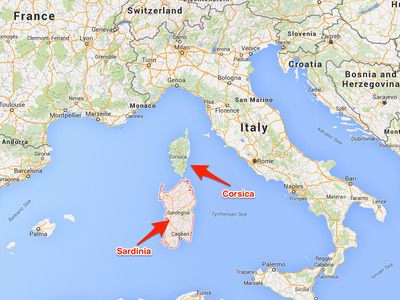 Sardinia and Corsica are located off the western coast of Italy. 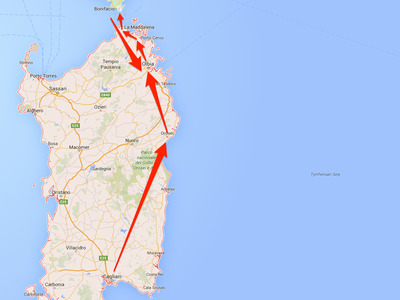 It takes about an hour to fly from Rome into Cagliari, the southernmost city in Sardinia. 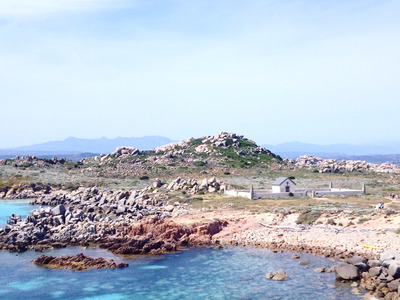 We planned to work our way up the eastern coast of Sardinia by car, stopping along the way to see the ritzy Costa Smeralda, then jump to Corsica via ferry. With this plan, we hit a shoulder-season snag: The high season in the area is July and August, so in late May and early June, there are extremely limited and expensive flights in and out of Corsica. 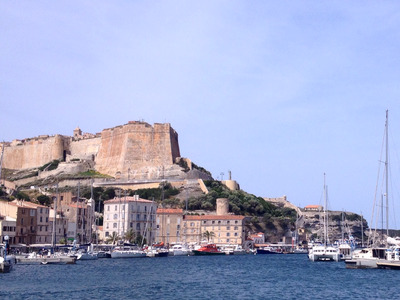 Instead, we chose the less-efficient method of spending just a few days in Bonifacio, Corsica, and looping back around to fly out of Sardinia. We booked a mixture of Airbnb apartments and hotel rooms for our trip. 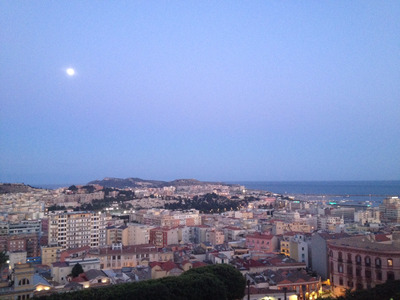 Our first was a lovely room in the historic center of Cagliari, where we'd planned to spend about 24 hours. Thanks to some flight delays, it ended up being a little less than that, but ultimately enough. Book our Airbnb in Cagliari. We then rented a car to drive up to Orosei, a 2.5-hour trip we vastly underestimated. Sardinia is enormous. It takes about four hours to drive end to end. However, it was a beautiful trip through the mountains. 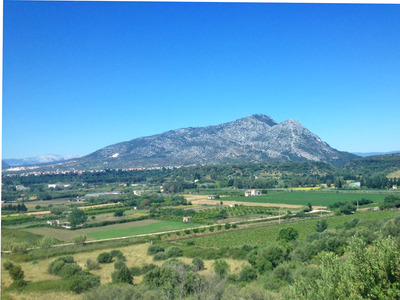 A view of the Sardinian countryside from the car. While travelling in Spain, we'd learned lacking an international driver's licence limited our rental car options, so before we left for this trip we made sure to get one ($50). No one ever asked to see it. Our waiter at dinner that evening in Orosei, a lovely -- if quiet -- mini-city of narrow alleys with a distinctly small town feel, recommended the beaches in the national park to the north. We followed his directions down a pothole-ridden dirt road to Berchida, a stunning expanse of uninterrupted white sand edged by clear turquoise water on one side and low desert shrubs on the other. In Orosei, we stayed at the fabulous Albergo Diffuso Mannois. Buoyed by a post-beach afternoon drink in the shade at the local Agriturismo (one of the many working farms on the island that takes on tourists as temporary lodgers at a low price point), we continued on to Palau. 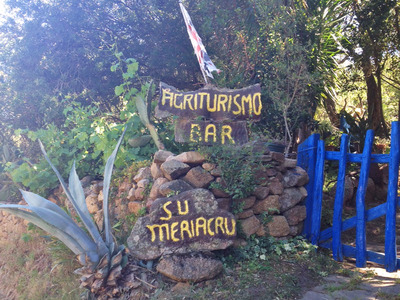 Agriturismo Su Meriacru, home to a delightfully shady outdoor bar. 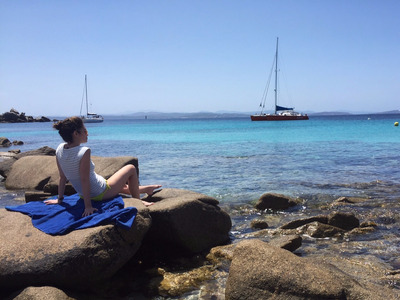 We chose Palau for its proximity to La Maddelena, a beautiful, beachy archipelago we hoped to visit, and stayed at the very nice Hotel La Vecchia Fonte. But alas, another shoulder season snag: Our designated day for La Maddelena dawned windy and cold(ish), so we went with Plan B, a day of ambling through some of the pristine towns on the Costa Smeralda. 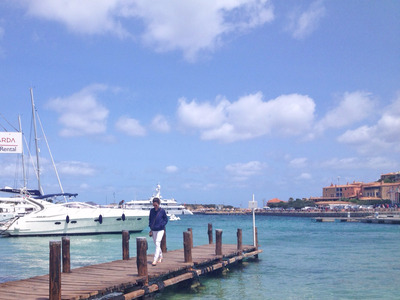 Walking along the dock on a windy day in Porto Cervo on the Costa Smeralda, Sardinia. 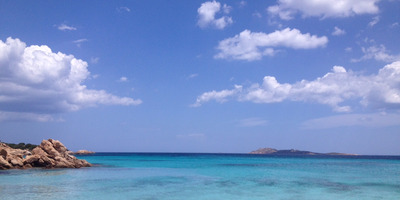 The Costa Smeralda is the yacht capital of the island. In the 1960s, wealthy vacationers led by billionaire Karim Aga Kahn bought swaths of land from local farmers for $25,000 apiece and built their own resort hub. They named it Costa Smeralda, or the Emerald Coast, after the sparkling blue-green sea. 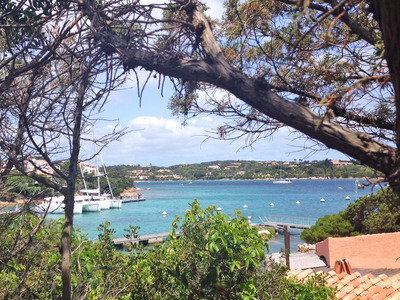 The sea shown through the trees in Porto Cervo, Sardinia. 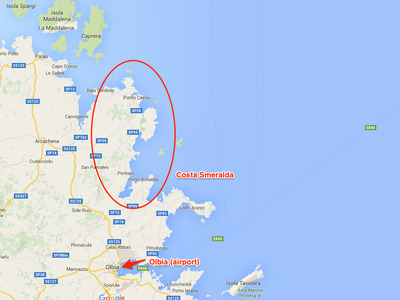 The exact boundaries of the Costa Smeralda are both somewhat unclear and entirely unnecessary: As you drive out of Olbia, the nearest big city and transport hub, signs direct you to 'Costa Smeralda' as well as individual towns. On the whole, driving around Sardinia is very straightforward. 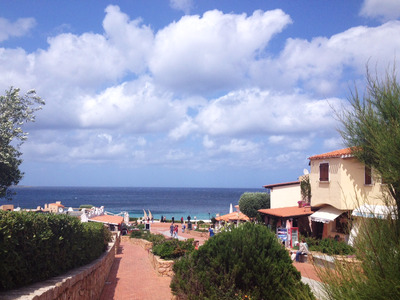 The centrepiece of the coast is Porto Cervo, which offers an open, luxury shopping plaza on the harbour that's reminiscent of Palm Beach, Florida. 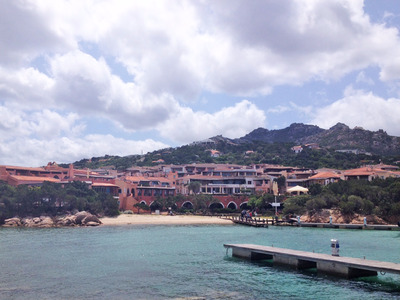 A few minutes south is Porto Rotondo -- best known for hosting former Italian Prime Minister Silvio Berlusconi's vacation home -- which has a similar vibe and an even bigger waterfront. In peak season, it's the perfect place for celeb-spotting. In shoulder season, the towns are largely empty minus periodic swells of tourists pouring off busses for an hour at a time. A few minutes north is Baia Sardinia (or Baja Sardinia, depending which sign you read), which is a little less ritzy but just as pretty, and has a lovely beach right in the center of town. Baia Sardinia, a town just north of the Costa Smeralda. Next we headed up to Santa Theresa, a charming town that provides the only ferry link to Corsica, which you can see in the distance from the top of the hill. If you make the same logistical error we did and have to drop your rental car in the city of Olbia, you can take the bus up to Santa Theresa in about two hours, for about $7. 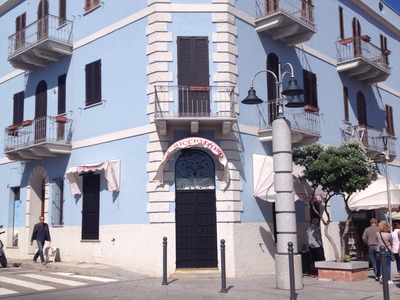 A hotel in the center of Santa Theresa, Sardinia. But be forewarned: Book your ferry reservation in advance. There are only two companies that provide passage a total of seven times a day in each direction, and they're subject to the weather. Too windy? No ferry. We learned that the hard way, and killed a few hours reading in a local bar. The ferry itself takes less than an hour, and before you know it, you're gliding past the white cliffs of Corsica into the harbour at Bonifacio. We booked an incredibly lovely Airbnb right in the middle of Haute Ville, the old town in the citadel on top of the hill, and had dinner in a footpath cafe -- a staple of the largely residential Haute Ville. 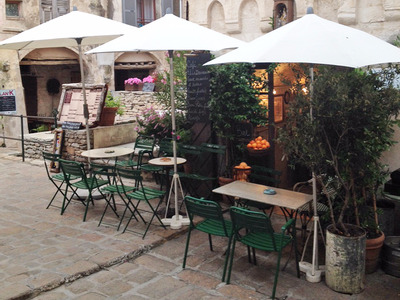 A footpath cafe in Bonifacio, Corsica. Book our Airbnb in Bonifacio. The next morning, we ambled down to the port to hop a boat to Île Lavezzi, the largest island of the rocky, protected archipelago of the same name about 30 minutes from Bonifacio. It's deserted minus sun-seeking tourists who come by boat and a small cemetary commemorating the largest shipwreck in Mediterranean history. However, our Airbnb host told us that in peak season, the island is so swarmed with tourists it's not even worth a visit. All the guidebooks tell you to bring snacks, but I'll add to that: Wear sneakers. The only way to navigate the island is by clambering over rocks. Luckily, the views are worth it. We spent about five hours on the rocks, watching the yachts and snorkelers. 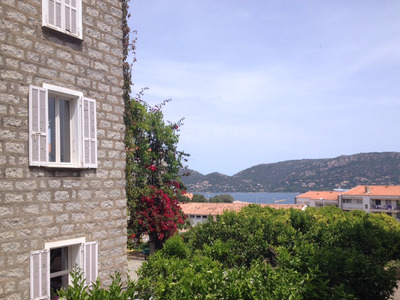 The next day, we rented a car to head up to the resort town of Porto Vecchio, which is absolutely charming. 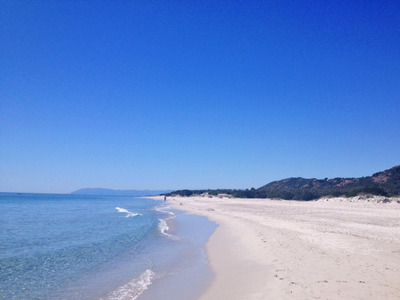 On the way home, we detoured to Plage de Palombaggia, which our copy of Lonely Planet called one of the most idyllic Corsican beaches. A view from Porto Vecchio, Corsica. Then it was back across the sea to Sardinia, where we hopped our bus back to Olbia and took up residence in the historic center of the city. 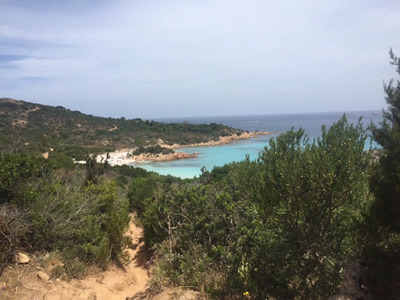 Spiaggia del Principe, Sardinia, from the top of the hill. That dirt path in the foreground is the only way to access it. We'd seen quite enough of the rather unremarkable town scenery by bus, so we snagged another rental car from the airport and zoomed off to Spiaggia del Principe, the rumoured favourite haunt of the Aga Kahn. It was perhaps my favourite beach of the trip: white sand in a protected cove reached only by a quarter-mile scramble down a steep dirt path, punctuated by a parade of sailboats headed back to port in the evening. On our last day, another beach: Spiaggia Capriccioli, which is just as beautiful but significantly more populated. Most beachgoers were locals, which makes sense when you realise we were there on a Sunday. Spiaggia di Capriccioli (I did manage to keep beachgoers out of this picture). We flew into Rome that night and spent a whirlwind morning covering as much of the city as possible before catching our flight back across the Atlantic, just in time for peak season at home in New York: summer. 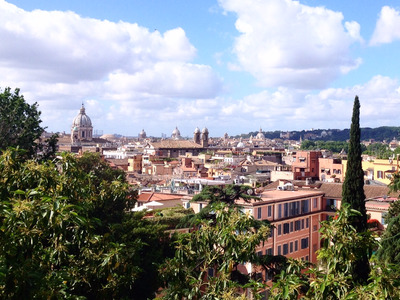 A view over Rome, Italy.